E.G.G. Station Zone is the fifth and final zone in Sonic the Hedgehog 4 Episode I. It has only one act with the title of Final Showdown in Space. 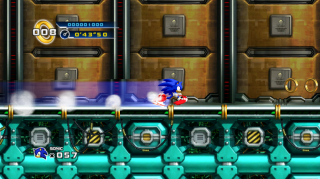 Taking place in a space station similar to Sonic the Hedgehog 2's Death Egg Zone, the level is a one-act boss rush of the previous Sonic 4 bosses. Eggman puts the Lost Labyrinth Zone and Mad Gear Zone Bosses in Pinch Mode from the outset, but puts the Splash Hill Zone and Casino Street Zone Bosses in Pinch Mode only after the first time Sonic attacks them. There is also a final boss which closely resembles Eggman's Giant Mech from Sonic 2. The chief difference between this and the Sonic 2 battle is that you are given the chance to earn rings before the initial boss run. In the console versions, there is a short cutscene showing Eggman retreat to his base in space, and Sonic travels to the base with a rocket that has Tails' symbol on it, which shows he presumably made it for Sonic to travel to the station. This cutscene is not in the PartnerNET build or iOS version of the game. This page was last edited on 25 February 2018, at 12:55.